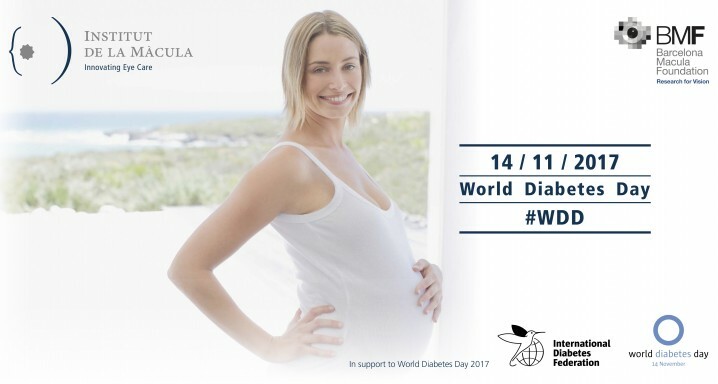 This year, World Diabetes Day has chosen to focus on how the disease affects women. Under the motto “Our right to a healthy future”, the aim is to highlight the importance of fair and affordable access to the medicines and technologies essential to fighting this chronic pathology. One of the epidemics of the 21st century, diabetes affects around 600,000 people in Catalonia. From the ophthalmological perspective, attention always needs to be paid to the effects of diabetes on the retina. Initially, these consequences are silent and imperceptible but they can lead to blindness. It is important for diabetes awareness campaigns to reflect the consequences of this metabolic pathology on the eyes of patients. The associated conditions should be carefully diagnosed, treated and monitored. And it should be borne very much in mind that losses of vision are in many cases irreversible. Therefore, as in so many fields of health, timely action is vital. Women with diabetes who fail to monitor the progression of the disease have a greater probability of developing problems, according to the International Diabetes Federation (IDF). It talks of a higher risk of mortality and morbidity, both for mother and child. The risks are minimised by treating the pathology and controlling and monitoring the pregnancy. This monitoring is led by the obstetric team —a specialist doctor and a midwife - with the support of diabetes and other specialists, such as an ophthalmologist. Degree of retinopathy at the time of conception. Low basal glycaemic control and marked reduction in glycosylated haemoglobin (HbA1c) at the start of pregnancy. Duration of the diabetes and arterial hypertension that is either chronic or induced by the pregnancy. Efforts prior to conception should concentrate on achieving the best possible metabolic control. The above exploration of the ocular fundus should be conducted in the first three months. In the case of normal results and a mild or moderate proliferative retinopathy, an examination will be prescribed every three months. If the woman presents severe non-proliferative DR, the examinations should be monthly. In the most minimal case of neovascularisation laser pan-photocoagulation should be applied. The severity of the DR will determine the frequency of the examinations. It should be noted that if the DR needs to be treated, the therapy should be completed before conception. Approximately 8 in every 100 pregnancies are affected by gestational diabetes. This is a severe threat to maternal and child health that is often ignored. Women with gestational diabetes do not run a greater risk of developing DR. However, they should be subject to strict medical control in order to avoid the consequences of the diabetes. More information: Vision disorders associated with diabetes.